Members of the Spanish Lords. The Spanish Lords are a primarily Puerto Rican gang based on the Latin Kings, a Hispanic street gang based in New York and Chicago. They appear in Grand Theft Auto IV and Grand Theft Auto: Chinatown Wars. They are one of the largest criminal organizations operating in GTA IV, having turf in South Bohan, Cerveza Heights, East Holland and south Alderney City; they maintain a strong street presence within these territories. Some notable former members of the gang include Manny Escuela and Lyle Rivas. Like the Latin Kings, they wear yellow and black; in addition to their gang colors, their clothing also usually features the Puerto Rican, Dominican, or Colombian flags. Some are seen wearing t-shirts with "Boricua" printed on them. Most often, the Spanish Lords are seen driving in Cavalcades and Primos painted metallic red with gold rims and trim. Members often have "Pitchfork" or “Crown” tattoos on their neck/head, which along with the black and yellow beads, are symbols of The People & Folk Nations, specifically the People Nation. There are four sets of Spanish Lords members — a short, fat, bald man with a black top and gold chains (looking somewhat like Manny Escuela); a taller, heavyset dark-haired man, usually with a mustache, in a puffy coat, with red, white, and blue and Puerto Rican colors; and a younger, slim man with a yellow or white t-shirt, a yellow, red or blue cap, and a baseball jacket. The last set all have shaved heads who wear camo pants or jeans/shorts. and represent by flying the Puerto Rican flag or wearing Puerto Rican colors. some member of the Spanish Lords don't wear yellow, but most the time Spanish Lords can be seen repping yellow as there primary color. Sometimes, if you hit a car belonging to one while he's in it, the gang member will come out with either a Knife or Baseball Bat. At night they usually walk around with SMG's and Pistol's. In GTA Chinatown Wars, in a string of Wu Lee's missions (Carpe Dime, Store Wars, Copter Carnage and Kenny Strikes Back), protagonist Huang Lee must attack the Spanish Lords; after which, he can raid their warehouse to steal a Burrito containing drugs at any time. In The Ballad of Gay Tony, they engage Luis, Armando, and Henrique in drug wars, ironically though Spanish Lords and Northwood Dominican Drug Dealers can sometimes be seen together (in The Ballad Of Gay Tony). There is no hostility towards either gang. Both gangs fight by each others side..
A Long Way to Fall (Gang members are killed by Niko Bellic while he goes up the apartment while in search for Teddy Benavidez). 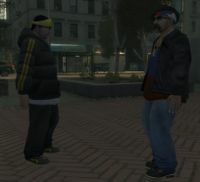 Sometimes if Niko accesses the police computer through a LCPD vehicle while in Spanish Lords territory, goes into the "Current Crimes" section, and chooses to respond to "Gang Related Violence" reports, the gang memebers will be Spanish Lords and Niko can fight them. The Spanish Lords unique modified Cavalcade. The unique supercharged V8 Primo also driven by the Spanish Lords. The Spanish Lords' gang car in GTA Chinatown Wars, the Dukes. The Lords' Burrito seen in the Drug Dealing side missions. Two Spanish Lords open fire. Two Spanish Lords, one of them firing his IMI Mini Uzi. A Lords member aiming his Glock 22. Another Lord aiming his Ithaca 37. This page was last modified on 2 May 2014, at 00:26.